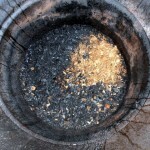 The Second burn of the TLUD was an attempt to increase the feedstock value by adding new material in through the secondary air gap during the process. 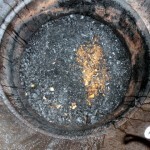 WE started with a half barrel of chips as a way to test the process and it worked reasonable well, although possibly 20% of the material was untouched by the time the embers started to drop from the bottom of the barrel. Some thoughts below the pics. The supplementary feedstock did reasonably well in the time. 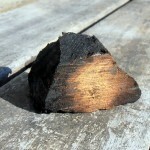 Anything under about 10mm charred reasonably well, the pieces around 25mm had a solid, uncharred core. Its possible that starting the burn with only half a barrel meant that any asymmetry in the lighting (with some diesel) was perpetuated because it had immediately to draw from below rather than getting a good, open, fire started before the process went anoxic. Its also possible that the asymmetry of the air flow from below was wider spread than we thought and the unburned part of the barrel was completely starved of oxygen. I had assumed that the multiple pathways available through chip would tend to even things out, but apparently, once the burn pattern is established, you are stuck with it. Not sure about the amount of smoke produced. It wasn’t huge and it didn’t last long, but it was much more than the previous burn which used dried Sugu (cryptomeria japonica) foliage as kindling. 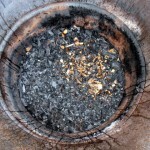 Sugu burns very hot and immediately, that may be the key to smokeless startups. I will not do partial burns in future and will make sure to get the widest possible fire front started above the feedstock charge before it depends on the up draft. Getting the barrel further off the ground should improve the airflow and reduce any ground effect, plus give us more room to unblock inlets as needed. I will also add a couple of steel bars across the top of the barrel to increase the air flow and improve combustion of the evolved gases, but that also demands building a retort to sit inside the afterburner, like this. Supplementary feedstock needs to be reasonably dry and probably less than 15mm at its thickest point but I suspect can be of arbitrary shape and should be added as soon as possible once the top of the barrel is anoxic. 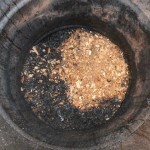 A longer time in the barrel would have produced a better result and a more even burn below should create better charring conditions above. Another burn. Add the steel bars which will also give room to add supplementary feedstock, probably put the failed feedstock from Thursday into the mix and give it another burn and try to find a 100-150 litre barrel to stand on top of the burn barrel as a retort. I have 2 new WWOOFERS arriving Monday, guess what they will be doing. Hi Earl, I suggest posting a link to this post in selected international biochar production discussion groups. There are people in these groups with lots of similar TLUD experience who may have some useful opinions. Thanks Trevor. I’ve joined up with the Linked-In group so I might drop it there. Right now I’m pretty snowed under with spring, so to speak. Haven’t even been able to have another burn lately.